Gosh they really do grow up so fast. My three are now 13, 15 and 16 and have refused to do Santa photos for three years now. Love the photo, so cute on Santa knee!!! Wishing you all a Merry Christmas! Look at those smiles. So cute! Have a great Christmas! They sure do grow up quickly... That Christmas my girls still believed in Santa... It seems so long ago yet just yesterday. Thanks for linking up with us at the Oh My Heartsie Girls Wordless Wednesday. Wishing you and your family a magical and memorable Christmas. The kids look so cute in the photo. Merry Christmas to you and family. I know. Our daughter just got married and we reminisced by going through all her old photos. It's a bitter sweet feeling. They do grow up so fast! My "baby" turns eight in February. I just look at them and wonder where all the time went. Merry Christmas to you and yours, Cathi! Thanks, Deborah! Same to you! Thanks, Judy! Same to you! So cute! I know its like you blinked and your kids have grown! Oh wow :) Such a beautiful photo - great memories indeed! Hope you had a wonderful Christmas! Such an adorable picture!! hope you and your family had a wonderful Christmas, and Santa was good to all of you!!! It is so much fun to look back on the pictures of Christmas past. 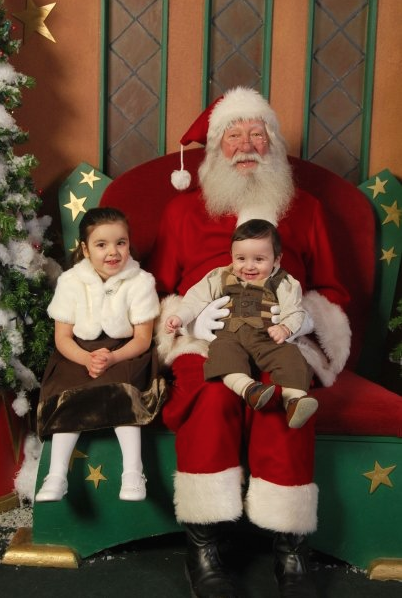 I look at pictures of my kids with Santa over the past few years and find it so hard to believe how time has flown. Don't blink, you'll miss something! My boy is 16, and I'm still trying to figure out where all those years went. I pulled out his first Santa photo and nearly cried. His baby sister is 2, and she won't go near the big guy lol. They do grow up so fast, I have a photo that I bring out every Christmas that was taken with Santa at Harrods in London when my girls were 5 and 7 they both had matching fushia coats and looked adorable, it seems like only yesterday but they are now in their 30's with kids of their own! All of my daughters were terrified of Santa when they were babies!! I used to have to walk by him and cover my daughters eyes so they wouldn't see him because they would burst into tears! I am blessed with 2 grandchildren coming this year so I'll be able to go through it all again with them! I'm super excited! What a great picture.. I love looking back when my children were babys and recalling those memories. Just last week we sat down and watched old home videos. My daughter recently got married, and it was our chance to go through photos past. All I can say is wow!! Where did the time go, and believe me, we created an amazing, and sometimes embarrassing video montage.